In September and October of 2013, I walked the Camino de Santiago Compostela, a pilgrimage route in northern Spain, that is more than a thousand years old. It is THE most transformational experience of my life. There's not a day that goes by that I don't think and reflect on my journey on The Camino. Listen to a recent interview that I did with Brendan Bolton from the Project Camino podcast. I believe that most who have traveled The Camino would say that it is a great metaphor for life. Everything gets boiled down to the essentials as you walk from albergue to albergue, carrying everything that you need for the 30+ day journey. I began with only two expectations and within the first couple of days, I had to even let those go. But what was opened up for me during my time on The Camino will remain in my heart forever. I guess I have always been drawn to doors and what they represent, which can be mystery, the great unknown but they also hold a certain excitement like, what's behind it?! 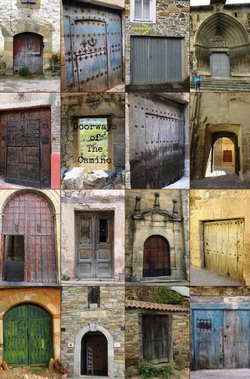 The Camino, as you might imagine, presented many doors both literally and metaphorically. I have created Doorways of the Camino poster as an homage to my time on this very mystical path. I am in the process of producing the poster so that it will be available for purchase. If you would like purchase the poster, please fill out the information on the Contact Page. Buen Camino!